Most men can't handle Hazel. But her best friend Josh isn't most men. Don't miss New York Times bestselling author Christina Lauren's new novel about two people who are definitely not dating...no matter how often they end up in bed together. Hazel Camille Bradford knows she's a lot to take--and frankly, most men aren't up to the challenge. If her army of pets and thrill for the absurd don't send them running, her lack of filter means she'll say exactly the wrong thing in a delicate moment. Their loss. She's a good soul in search of honest fun. Josh Im has known Hazel since college, where her zany playfulness proved completely incompatible with his mellow restraint. From the first night they met--when she gracelessly threw up on his shoes--to when she sent him an unintelligible email while in a post-surgical haze, Josh has always thought of Hazel more as a spectacle than a peer. But now, ten years later, after a cheating girlfriend has turned his life upside down, going out with Hazel is a breath of fresh air. Not that Josh and Hazel date. At least, not each other. Because setting each other up on progressively terrible double blind dates means there's nothing between them...right? 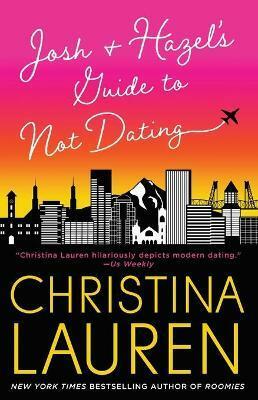 Christina Lauren is the combined pen name of longtime writing partners/besties Christina Hobbs and Lauren Billings, the New York Times, USA TODAY, and #1 international bestselling authors of the Beautiful and the Wild Seasons series, The Unhoneymooners, My Favorite Half-Night Stand, Love and Other Words, Josh and Hazel's Guide to Not Dating, Dating You / Hating You, Roomies, The House, and Autoboyography. You can find them online at ChristinaLaurenBooks.com, @ChristinaLauren on Instagram, or @ChristinaLauren on Twitter.